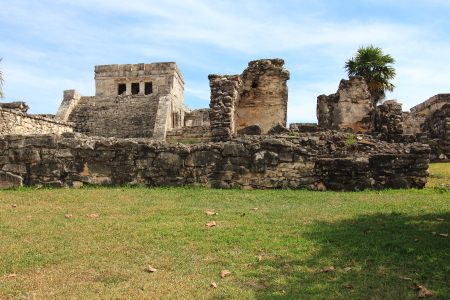 The Punta Venado EcoPark is about a 10 minute drive south of Playa del Carmen. 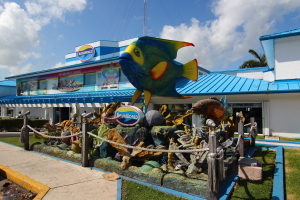 Its a little over 2000 acres with 2.5 miles of beach on the Caribbean coastline. 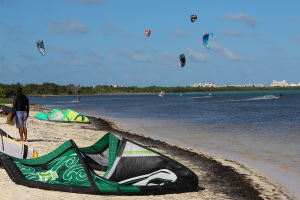 The outdoor adventure activities in this park include horseback riding, atv trails, mountain biking and water sports such as kiteboarding and snorkeling. Mountain bike trails are rated according to difficulty and cut through dense jungle where there’s a good chance of wildlife encounters with spider monkeys, deer or a variety of other small mammals as you ride. Whenever you get hot or tired and need a break from biking, you can always stop at one of the cenotes found near several of the trails and take a refreshing dip in these natural pools of underground water. 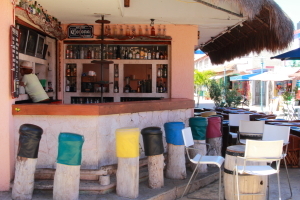 Another way to relax and cool off at the end of the day is to take the trail towards the park’s beach club where you’ll find a restaurant, bar, and the caribbean ocean. 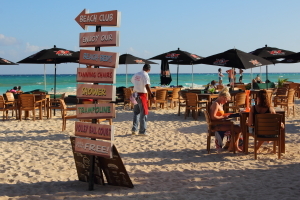 The annual jazz festival in Playa del Carmen would have ended Saturday night with one of their greatest hit songs called “September” but the crowd kept chanting for an encore. 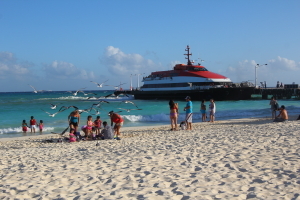 This event takes place in the last week of November at Mamita’s Beach and this years concert dates were scheduled on the 28th, 29th, and 30th. All three days of music are free of charge and music fans can bring their own refreshments or buy them from vendor stands on site. Each night features 3 different musical groups that play from 7pm to 11pm depending on how many encores the fans request. 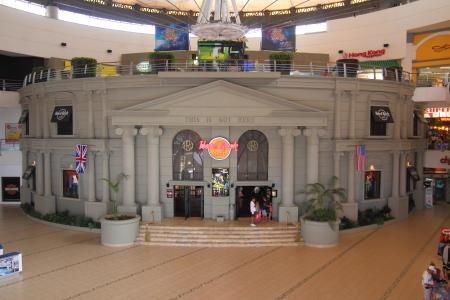 The photo gallery below shows each of the different groups performing on stage along with a sample of the light shows that are also part of the entertainment. 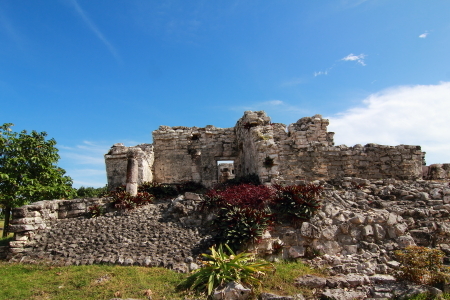 For those that are not familiar with the history of Cancun, it was just a deserted island 40 years ago that was separated from the mainland by a system of canals and consisted of nothing more than marshes, mangroves, jungles and beaches. 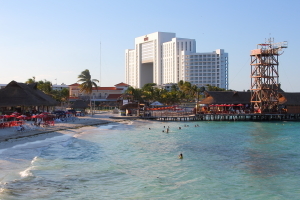 In 1969, however, the Cancun development was officially approved and construction began sometime in 1970. 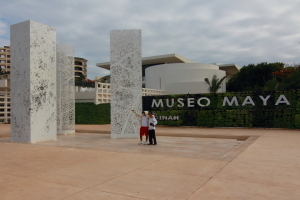 The master plan originally called for a hotel zone without permanent residential areas, a residential zone for permanent residents and an international airport. Needless to say, this plan required some very complicated engineering but in the end; the development project was successful. 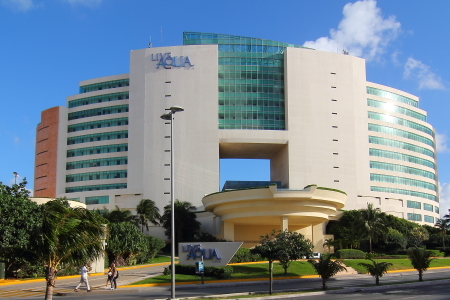 There are now 72 hotels located in a 17 mile stretch of beach inside the hotel zone with the Caribbean sea on one side and the Nichupte lagoon on the other. Most of these are rated 5 stars, the best rating achievable in Latin America. 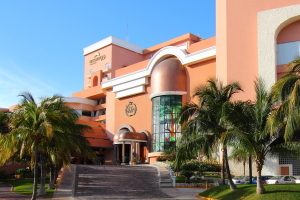 The first hotel to be built was the Playa Blanca which is now an exclusive adult only hotel now known as the Temptation Spa Resort. 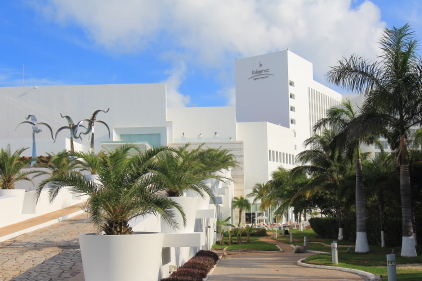 Another adult only hotel, Le Blanc Spa Resort , is now the most popular according to Trip Advisor, with Live Agua ranking second in this cateqory. 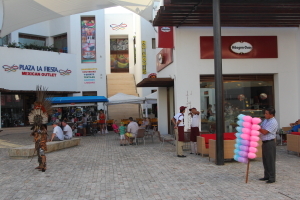 Just across the street is trip advisor’s highest rated shopping mall in Cancun called La Isla. 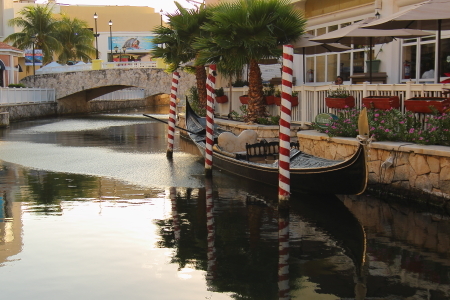 It is unique in that it features a marina at the rear of the complex where boats can be rented, as well as, a canal running through the shopping center that gives it the look and feel of Venice. 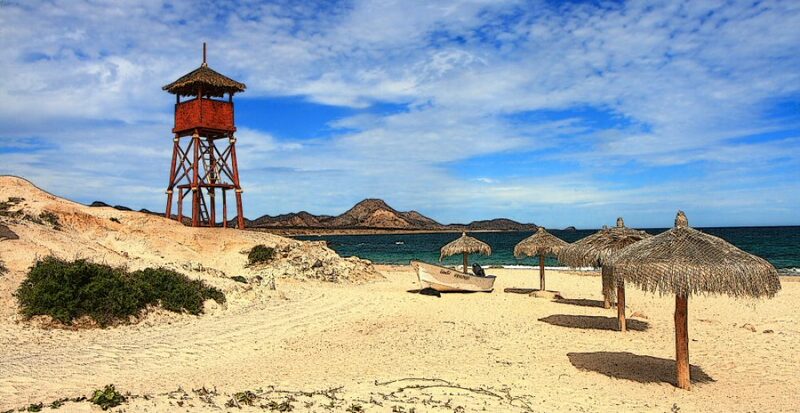 Also featured in this post is a photo of Playa Del Fines which is the largest and best maintained of the public beaches on this 17 mile stretch of road which is dominated by hotels that limit public access to their beach area as much as possible. 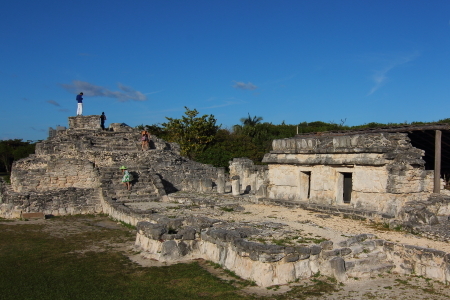 The 10th annual Maya Jazz Festival is a 3 day event that starts in the last week of November. 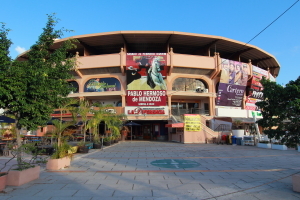 It is considered to be one of the top 10 Jazz music festivals where many jazz greats such as Herbie Hancock, Sergio Mendes, Yellowjackets and Fourplay have performed over the years. As there are no admission charges it is probably the best bargain in the world of live entertainment as well. 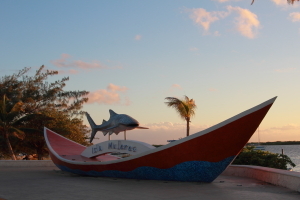 The photo above shows the stage on Mamita Beach which is located in Playa del Carmen. All shows start around 7 pm and continue until at least 11 pm each day. This years festival featured several jazz all stars including Wayne Shorter, Pancho Sanchez, John Scofield and Level 42. Considering the whole line-up of musicians appearing this year, Wayne Shorter is arguably the most accomplished. He is a 6 time grammy award winner, saxophonist and composer. His professional career started with Art Blakey’s Jazz Messengers around 1957, followed by a stint with the Miles Davis Jazz Qunintet beginning in 1964. About 5 years later Wayne co-founded the Jazz Fusion group, Weather Report, which produced many high quality albums in diverse styles. This band finally broke-up in 1985 but Wayne has continued to record and lead groups in the jazz fusion style, winning his last grammy in 2004 for the album titled “Alegria”. 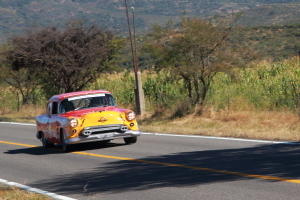 The Pan American Road Race was initiated in 1950 by the Mexican government to promote a new system of highways that had been built across the country to improve commerce and tourism. After accomplishing their goals over a five year period, the government decided to drop the Pan Am Road Race. 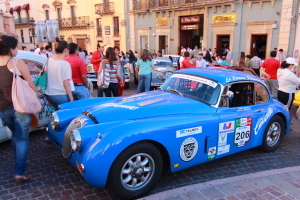 Some years later, the road race was revived by interested private parties in 1988 and is now in its 22nd consecutive year of open road racing from southern to northern mexico. Almost anyone can take part in this event in one of three separate categories. 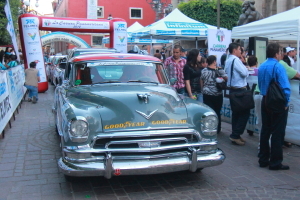 The first, is the tourist level which requires only a 1965 or older vintage car with the necessary safety features. The second way to participate is at the competitive level which requires a better vehicle and greater driving skill. While the 3rd and highest level of participation is classified as full competition. 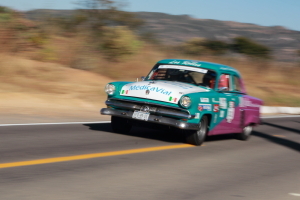 Needless to say, competing at this level requires a thoroughly prepared vintage hot rod which can cost a small fortune. 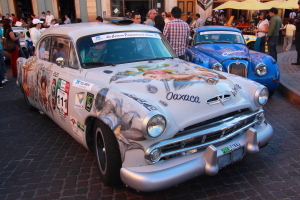 This year the Pan AM started on October 19th in Veracruz and continues in stages over a 7 day period, eventually finishing in Zacatecas. The length of each day’s speed stage can vary from 3 to 16 miles through what are mostly winding mountain roads. The cars are started in 30 second intervals with the fastest cars scheduled to run first. At the end of the week the cars with the lowest elapsed time are declared winners overall and by class. Racing on winding mountain roads can be hazardous and this year has been no exception. There was a fatality on the very first day of this event when a driver lost control of his Studebaker and rolled the vehicle at high speeds. 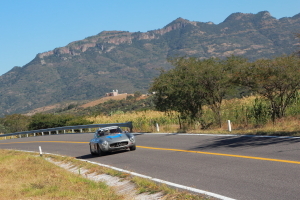 Also, a few days later while racing in the Queretaro area an unusual accident occurred when 5 cars ran into each other around a dangerous curve in the road sending all of them to the bottom of a cliff. Fortunately, the injuries where no more serious than a few broken bones but all the cars had to withdraw from the race due to major damages. September 20th to the 23rd was the inauguration of Club Hipico and Grand Prix Equestrian Show Jumping in San Miguel de Allende, Mexico. 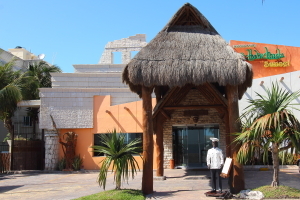 It is located in the exclusive gated community of Otomi Lake and Villas close to the historic center of this world heritage site. 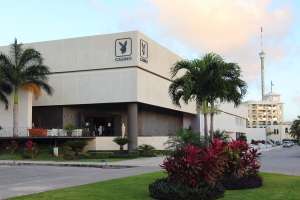 The club features a restaurant, galleries, 3 paddocks and 3 separate courses for various levels of competition. In the future they will be hosting both national and international equestrian events. 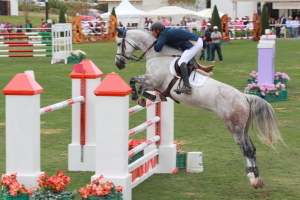 The outcome of a Grand Prix show jumping contest is based on numerical scores determined only by whether a horse attempts an obstacle, clears it, and finishes the course in an allotted time. Obstacles include verticals. spreads, double and triple combinations of each, along with many turns and changes of direction. The object is to jump cleanly over all obstacles on a set course in the time allowed. Faults are assessed for exceeding the time allowed, knockdowns and refusals to jump the obstacles. 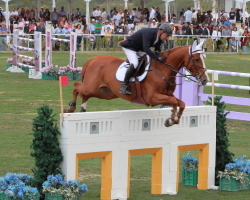 In higher levels of competition, such as Grand Prix events, the courses present more technical and complex challenges for the horse and rider. Not only does the height and width of obstacles increase but the turns become tighter and distances between obstacles shorter making the course more difficult to complete without faults. 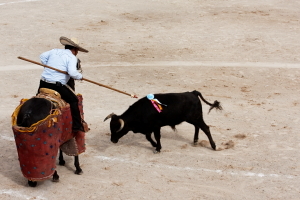 Due to the long-standing Spanish occupation of Mexico, the culture of this country was heavily influenced by their traditions such as bull fighting which has been a popular pastime for over 400 years. 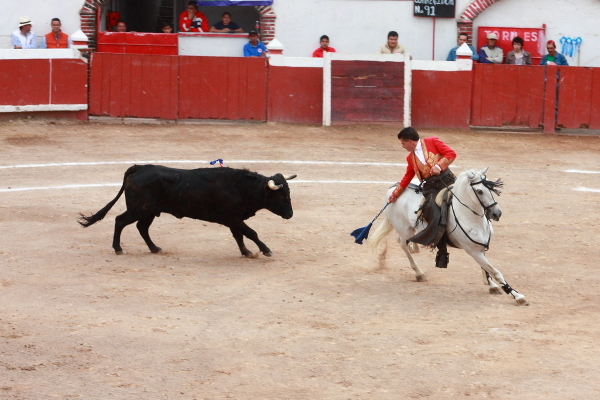 The Spanish style of bullfighting starts with Picadores circling the bull on horseback while jabbing it with lances, followed by Banderilleros who enter the ring on foot and attack the bull with barbed darts. Finally, the Matador takes control performing precise moves to please the crowd and attract the bull eventually using his sword to slay the animal. Another style of bullfighting that is also practiced in Mexico originated in Portugal and differs from the Spanish style in several ways. The Portuguese style involves 2 stages beginning with the Cavaleiros who fights the bull on horseback and stabs the bull 3 or 4 times with a javelin to weaken the animal. The next stage of the fight involves a suicide squad of 8 men known as Forcadors who challenge the bull without any protection or weapons. This begins with a front man who provokes the bull into a charge. If all goes well the front man performs what’s known as a face catch to secure the animal’s head while the other Forcadors rush in to secure the bull until he is subdued. 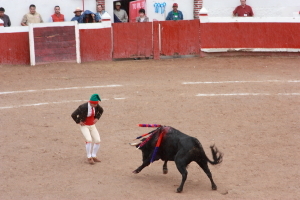 Herein lies another difference between the 2 styles of bullfighting, the bull is not slain by the Forcadors but released. 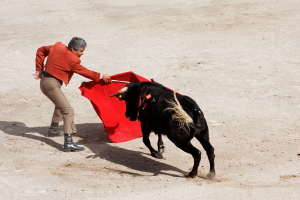 The matador’s purpose, however, is to slay the bull in the ring. 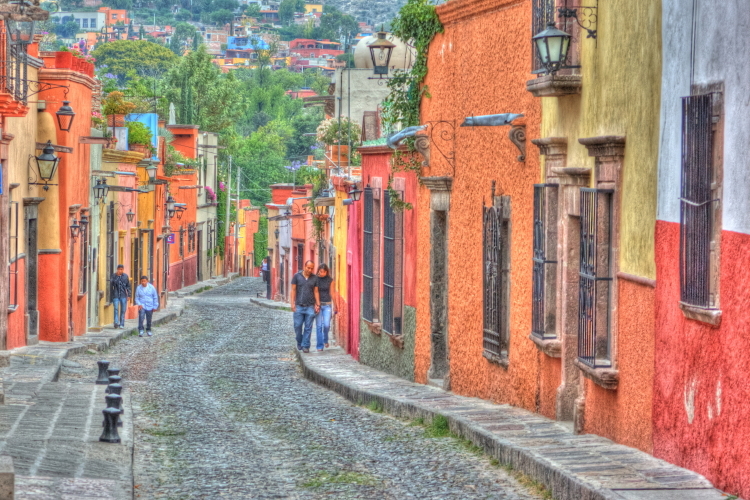 A 500 year old cosmopolitan city, San Miguel de Allende became a Unesco World Heritage site in 2008. In summary, Unesco is an agency of the United Nations and its purpose is to promote world peace and international cooperation through education, science and cultural exchanges. 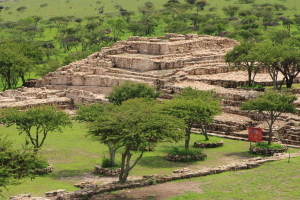 To be included in the world heritage list, sites must be of outstanding universal value and meet at least one of ten cultural or natural criteria. In addition to having outstanding universal value, San Miguel de Allende qualified for acceptance on 2 of the other criteria. 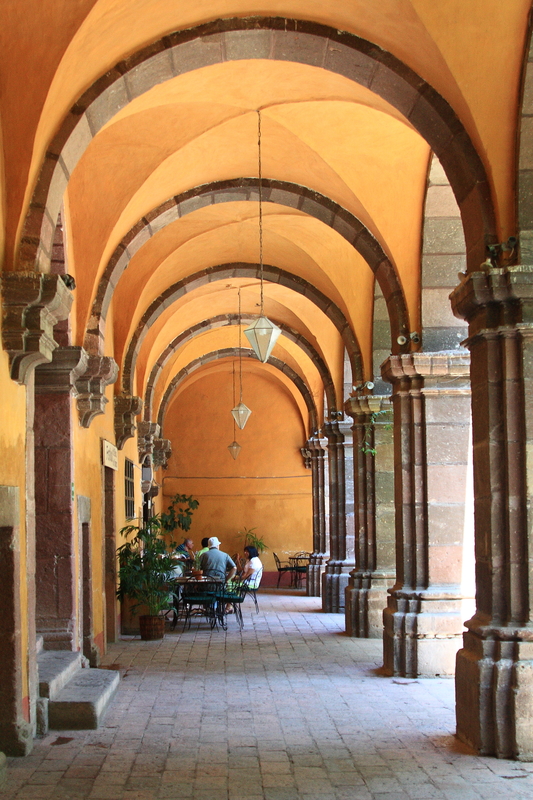 According to Unesco, “San Miguel is an exceptional example of the integration of different architectural trends and styles on the basis of 16th century urban layout. Both religious and civil architecture exhibit the evolution of different styles well integrated into a homogenous urban landscape”. 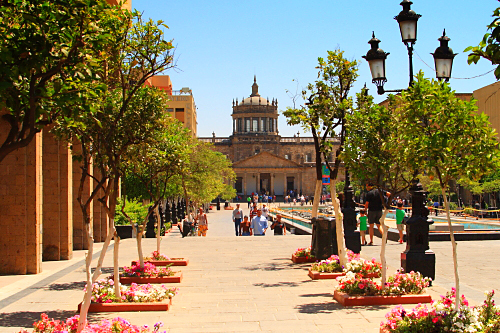 Unesco also considered San Miguel to be qualified as an exceptional example of the interchange of human values. 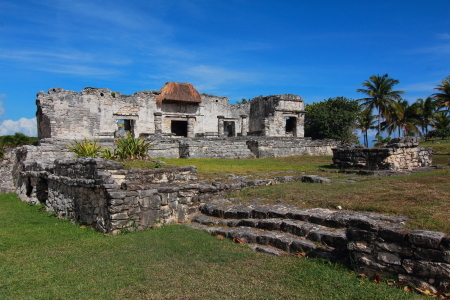 “Due to its location and function, the town acted as melting pot where Spaniards, Creoles, and Amerindians exchanged cultural influences; something reflected in its tangible and intangible heritage”. 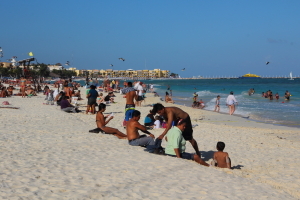 Additionally, the town exhibits an acceptable state of conservation while the legal system in place ensures protection of property and continuity. 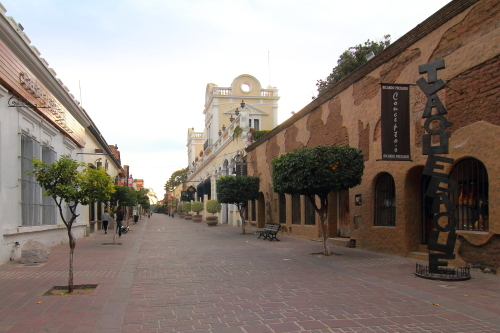 Thanks to this heritage and a thriving community of international artist, San Miguel has become one of the worlds most popular tourist destinations. 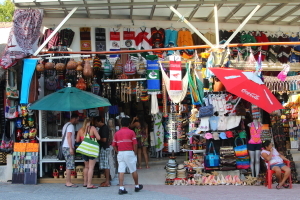 Visitor’s will find that studios, galleries and craft shops are ubiquitous in the central historical area. 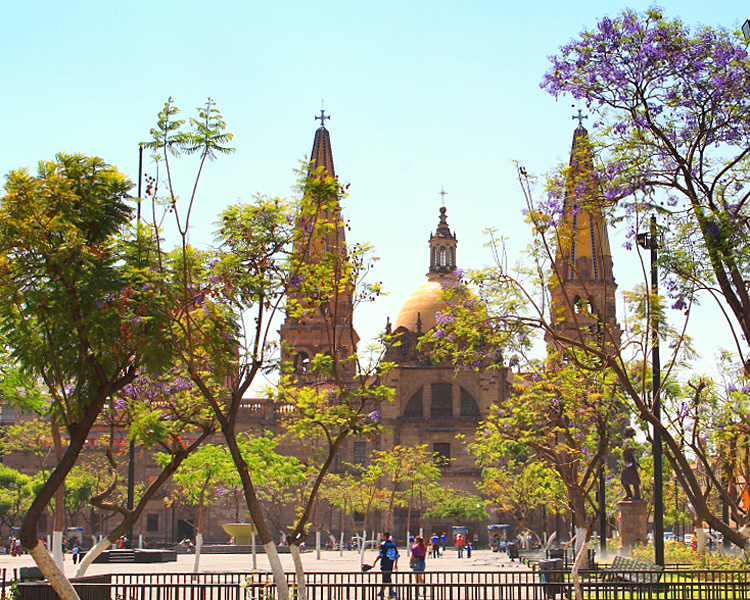 In addition, the art institute of San Miguel attracts many students with a variety of degree programs and workshops in the fine arts. 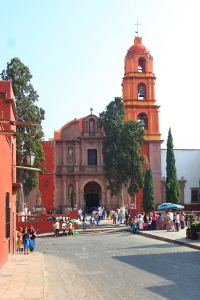 However, San Miguel is not just for art lovers, there are many other diversions here as well; such as music festivals, concerts, plays, film festivals, and other special events throughout the year that appeal to a wide variety of interest.